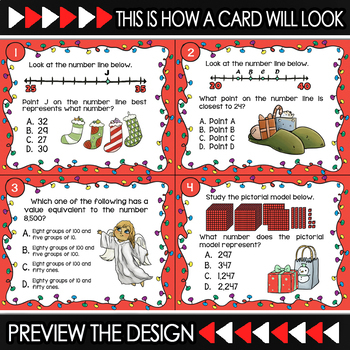 Give your students a beautifully designed set of Christmas-themed task cards that review the math concepts your students have been learning during the first half of the year. From understanding the basics of number lines, to various multiplication strategies, to rounding by 10 and 100, your troop of 3rd Graders will be engaged as they refresh their memories of math concepts & problem solving strategies that they've been practicing this year. The set has been designed in a festive way to help bring Christmas into the air of your classroom. The hand-drawn Illustrations on the task cards come from still-frames and characters from our Christmas Around the World animation that can be seen on our website at numberock.com (the first 2 minutes can be seen in the video preview above). Our free video and award-winning song, combined with the matching task card set you are looking at right now, will be this year's unanticipated smash success with your students. 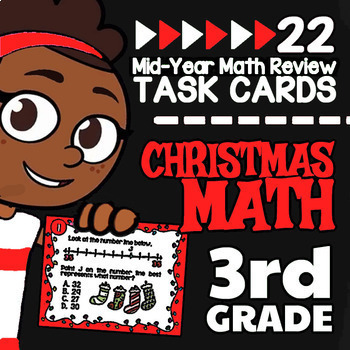 ✔ 22 uniquely illustrated Christmas math task cards decorated with characters & still frames from NUMBEROCK's Christmas Around the World Song. ✔ Full page images (JPGs) Upload to Google Classroom, Nearpod, or the learning environment of your choice to spice up your lesson. 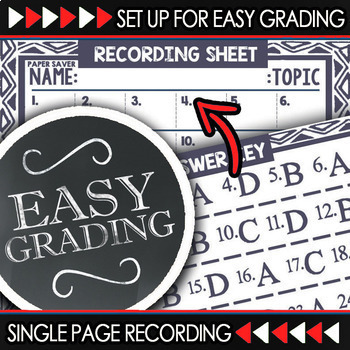 ✔ Recording sheets - Uniquely designed recording sheets formatted exactly like the answer key to make grading simple. The illustrations on our task cards come directly from our musical math animations that can be seen on YouTube or, alternatively, completely ad-free on our website, numberock.com. We highly recommend supplementing these task cards with the Christmas video. 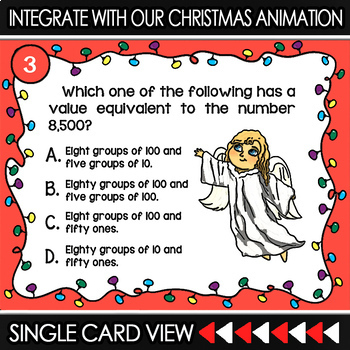 Doing so will provide an unprecedented level of engagement as your students seamlessly transition from the fun Christmas Video to completing illustrated task cards which feature matching illustrations from the video. We’ve also added a smattering of (wholesome) humor into the wording of the questions. All that being said, I’m highly confident that this will be a big hit with your students! Each question is aligned to the (CCSS) Common Core state standards, and is specifically designed to meet the documented student expectations for that standard. The questions are patterned on previously released state-sanctioned math tests, and the questions can be used for guided practice and independent practice. See more suggested uses below. This set is also aligned to the Texas Math TEKS standards, so it will work as a fun Christmas activity for all you Texas teachers out there, too! Feel free to e-mail us at [ lexi at numberock dot com ].